handicrafts and gastro market offer entertainment for the whole family. A tall Christmas tree and the life-size nativity scene, workshops, and local gastronomy create a special pre-Christmas atmosphere. M3, blue metro, get off at Árpád híd station, from there take tram 1 till Szentlélek tér stop – Note: The M3 metro line is currently under construction, use the replacement buses and see details here. Renting of skates is available: 600 HUF for adults and 400 HUF for kids. Sizes: double bladed: 22 – 26 (adjustable), single-bladed: 26 – 48. Tickets: entry is free to all programs but visitors have to purchase a mug for 500 HUF to be able to sip mulled wine or hot tea and taste the culinary delicacies. 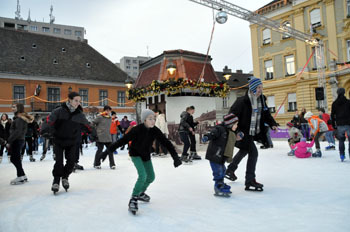 All concerts, performances and the ice rink are free. 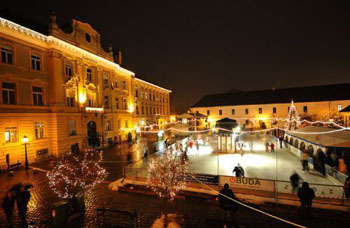 The Advent in Óbuda festival welcomes visitors for the 10th time. 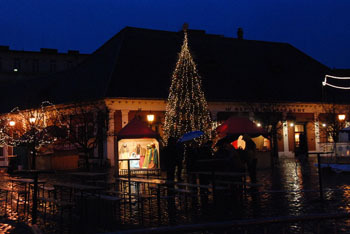 The Christmas market on Szentlélek tér offers a wide variety of quality merchandise. wooden toys for the little ones. You can also prepare your own holiday decorations in the craft workshop in the Esernyős toruist information centre on Main Square/Fő tér each Sunday between 14.00-19.00. Each Sunday at 18.00 a new candle will be lighted on the Advent wreath accompanied with singing and music. A 16-m high Christmas tree installation by the HelloWood company dominates the square. Built on 36 sqms from 40 tons of firewood taht will be be given to families in need after the festival. A large nativity scene depicting the birth of Jesus, an animal petting area (Sundays: 15.00-19.00) are the additional attractions on the festival in Budapest’s III. district. Kids will appreciate the ice rink on the main Square and they can also pet animals on Sunday afternoons next to the nativity scene. Concerts, puppet theatre performances provide additional entertainment every weekend during Advent. Smaller kids can have a ride on the antique merry-go-round. A whole promenade will be dedicated to local food and winter drinks. roasted chestnut and other sweet delicacies. You can also taste and buy artisan cheeses and chocolates. No Christmas fair goes without traditional winter drinks: you can sip spicy mulled wine, hot tea, hot chocolate, pálinka (authentic Hungarian fruit distillate). TIP: If you buy a Christmas mug on the festival you’ll aid the charity project of the Hungarian Maltese Charity Service: they raise money to support those in need in the Transcarpathia region. If you really want to see how people in Budapest are preparing for Christmas and you’ve had enough of the hustle and bustle of the downtown head for Óbuda! See also official website of the event!